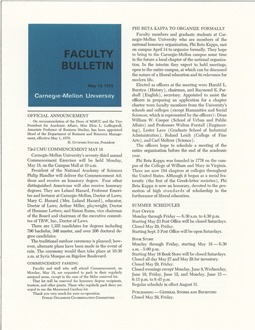 The Carnegie Tech Faculty Bulletin was a weekly in-house publication that ran from 1916 until 1971. Intended to keep faculty up to date on each other's activities, the Bulletin is a good resource for tracking both the career and personal lives of faculty and staff members of the University. The original hardcopy bulletins were never indexed so this online version is the first time searching across the entire span of the publication has been possible.